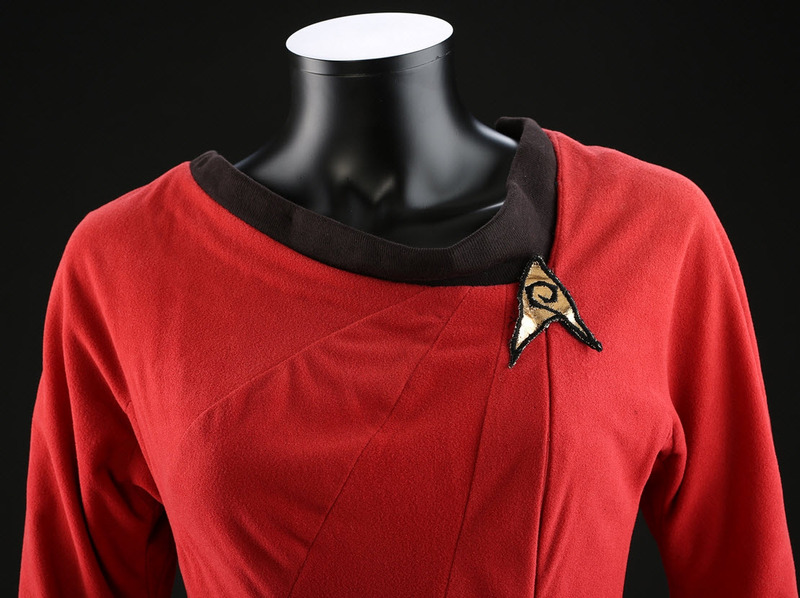 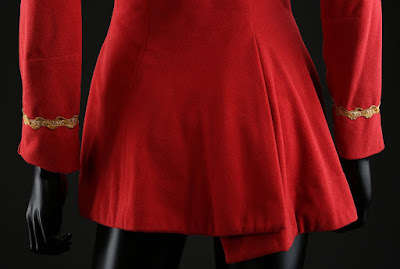 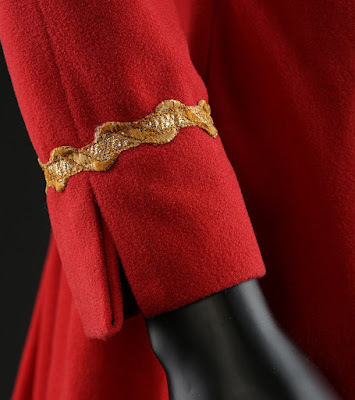 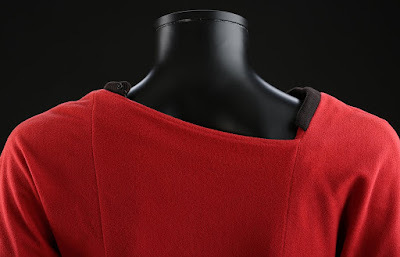 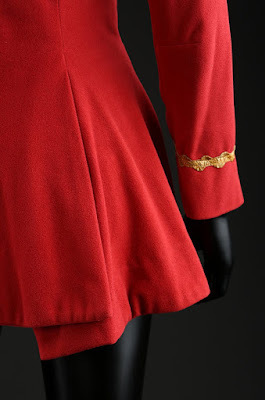 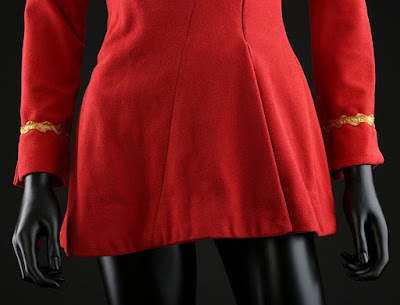 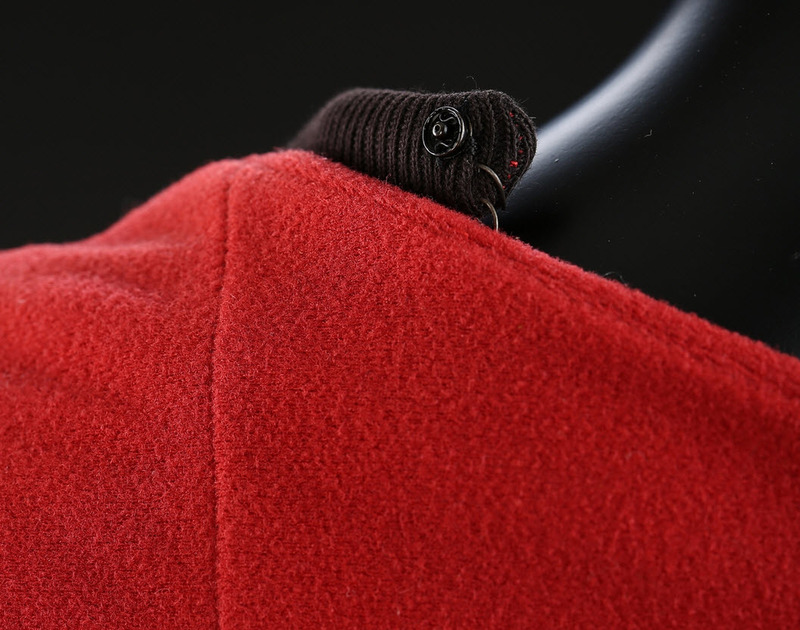 Below are some detailed photos of a beautiful 2nd season red velour Starfleet dress worn by Nichelle Nichols in her role as Lt. Uhura on Star Trek: The Original Series. 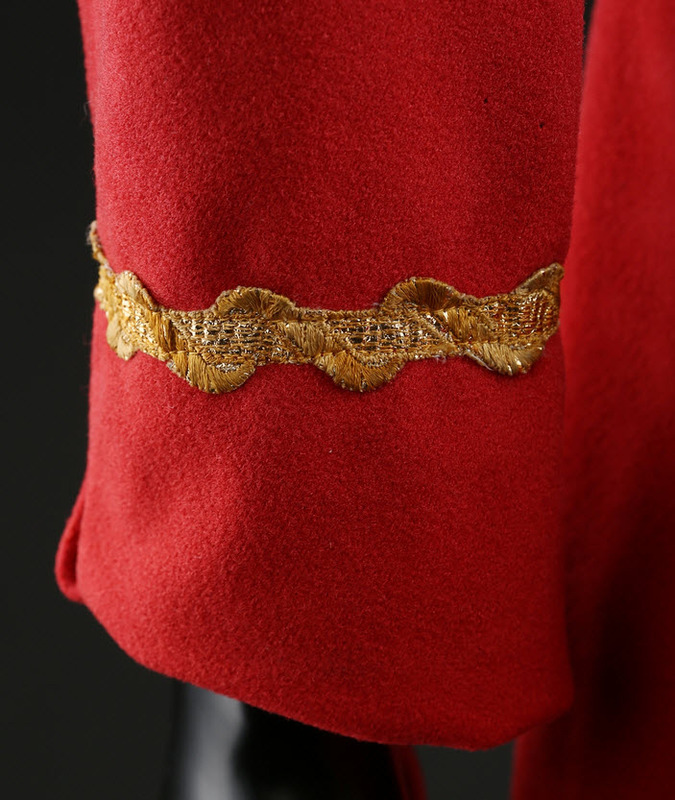 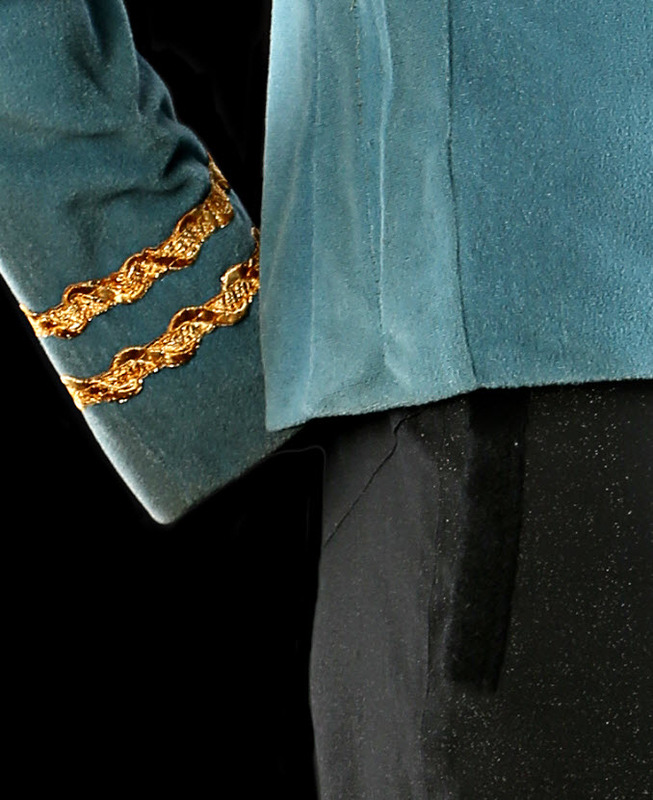 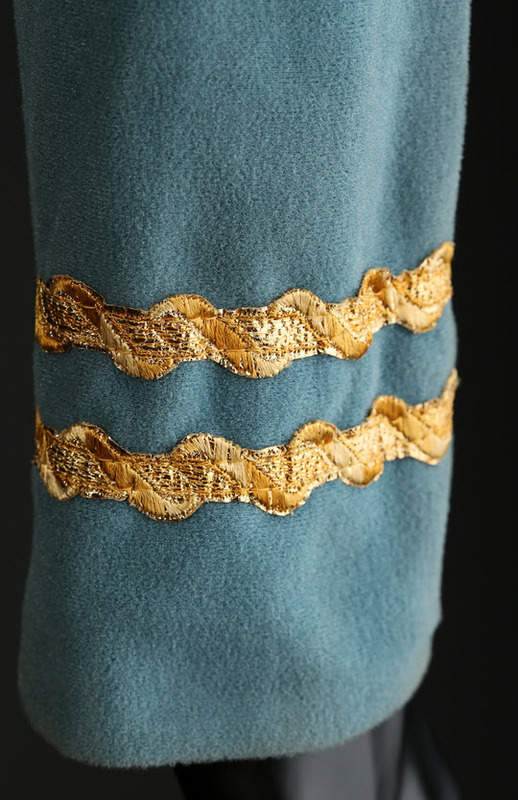 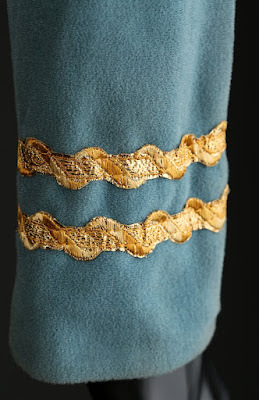 This costume still retains its original Engineering division badge on the left chest as well as a single band of gold braid to denote rank on each of its sleeves. 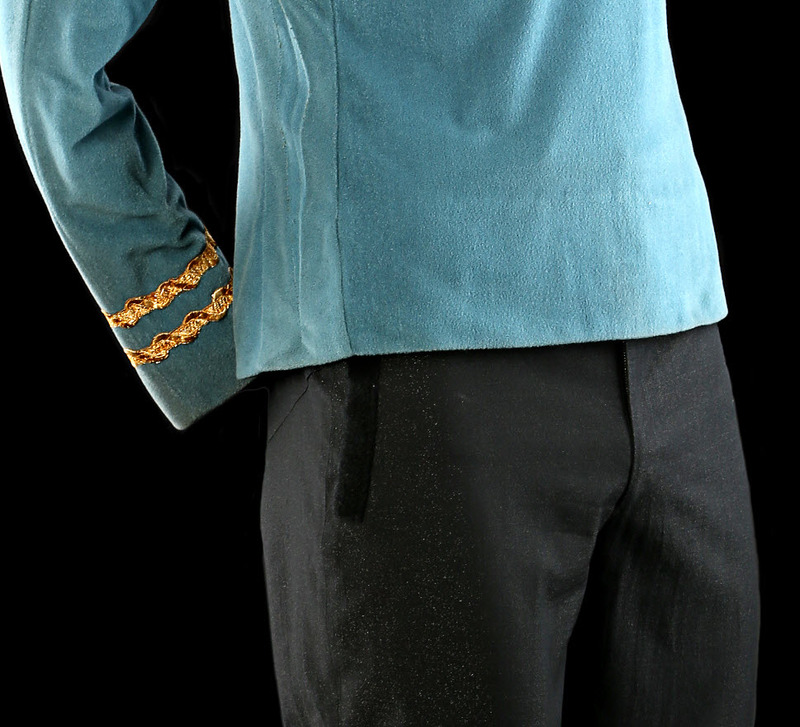 This uniform was recently offered as Lot 334 in the Prop Store of London's "Treasures from the World of Film & Television" entertainment memorabilia auction that took place last month at the ODEON BFI IMAX theatres in Waterloo, London, England. According to the auction catalog description, it is believed to screen match to the episodes "Return to Tomorrow", "The Gamesters of Triskelion", "The Ultimate Computer" and "The Omega Glory" based on the precise alignment and stitching of the patch and braid. 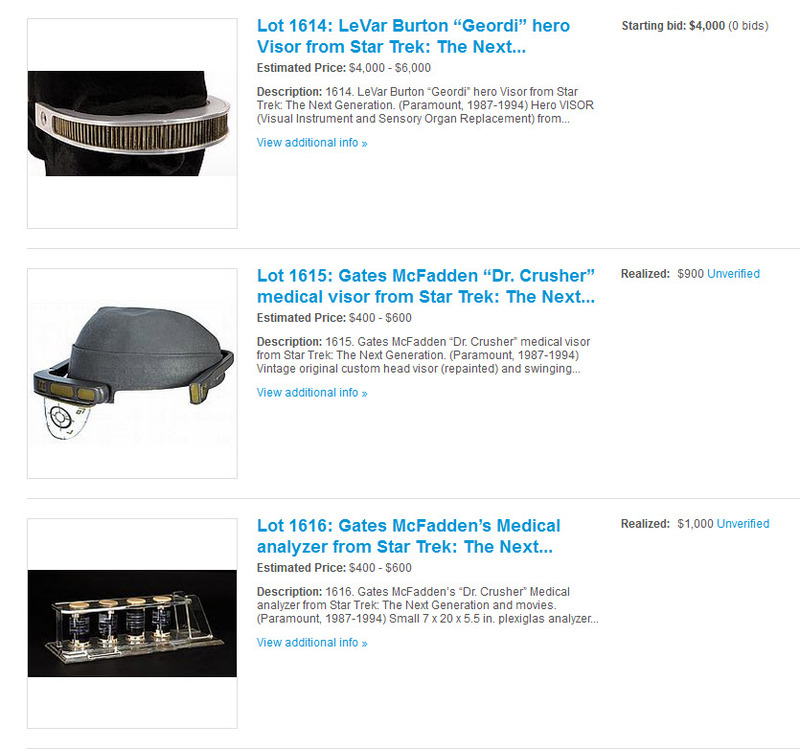 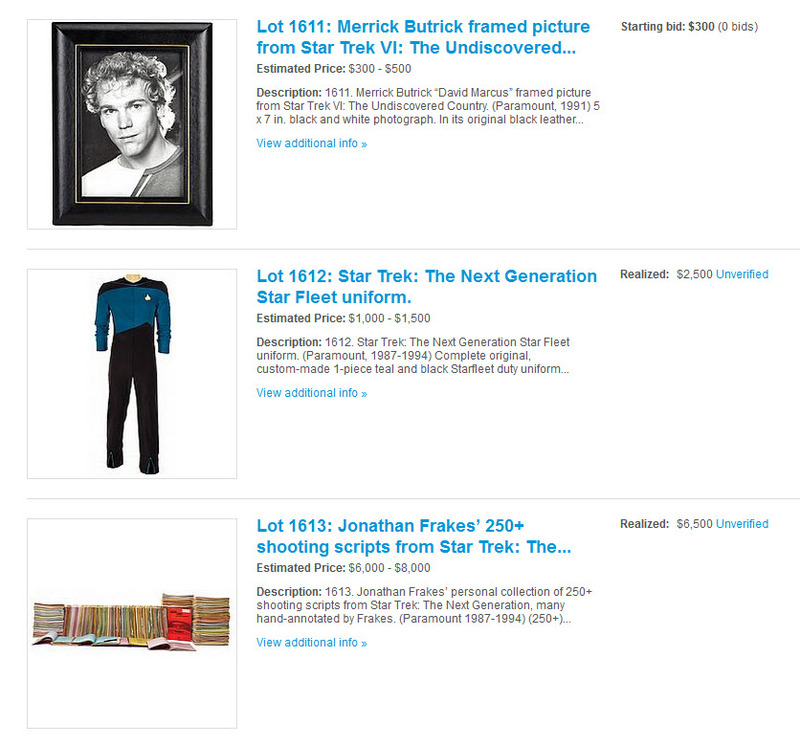 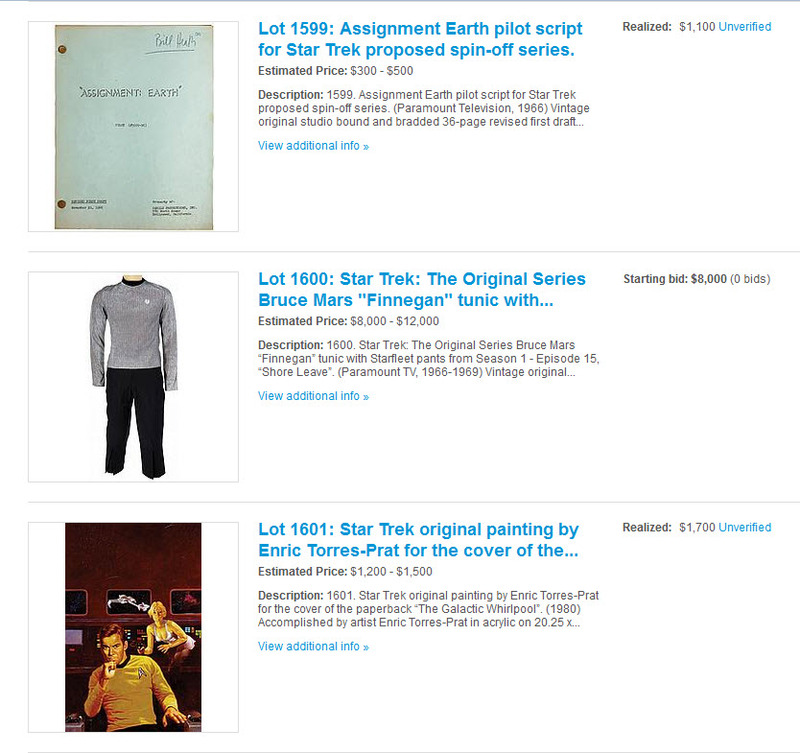 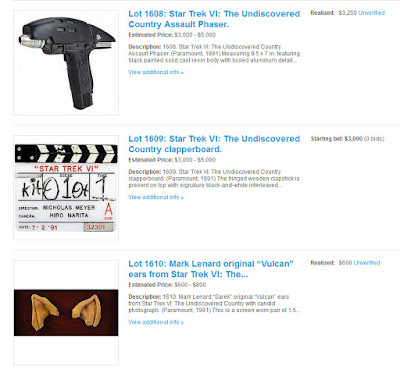 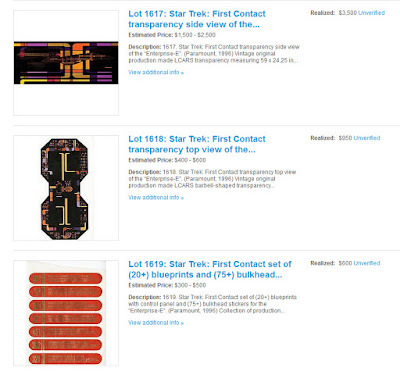 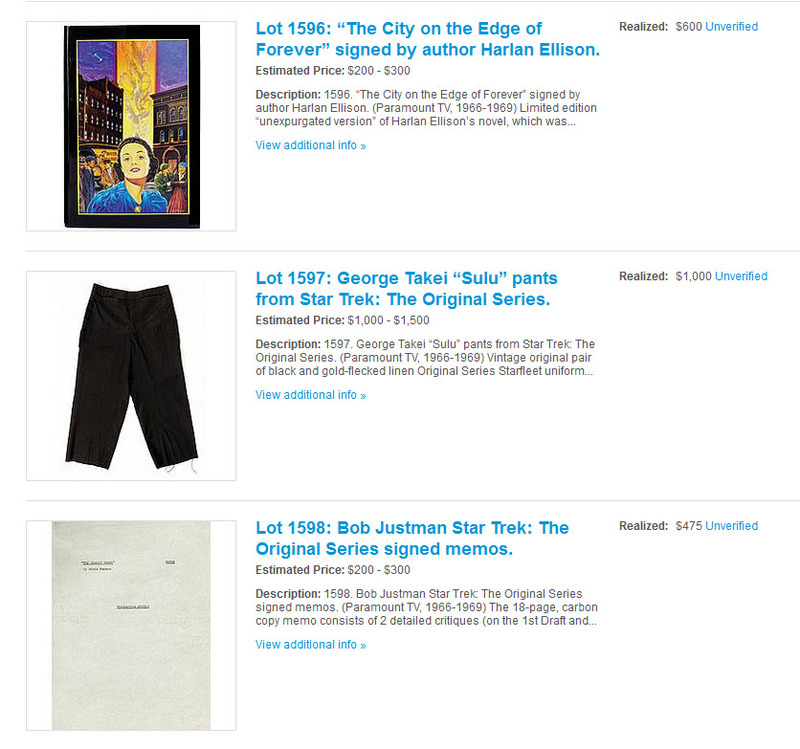 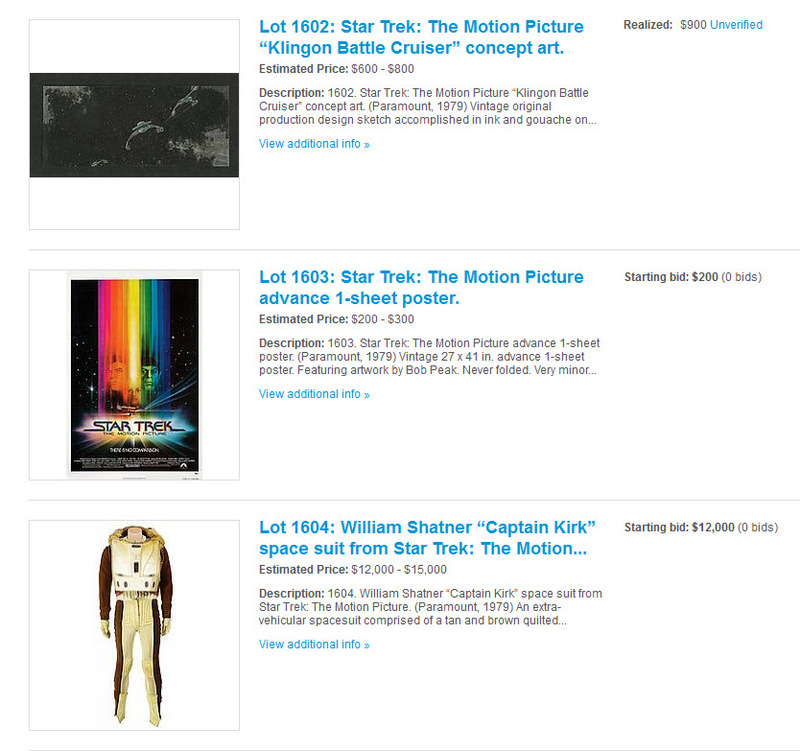 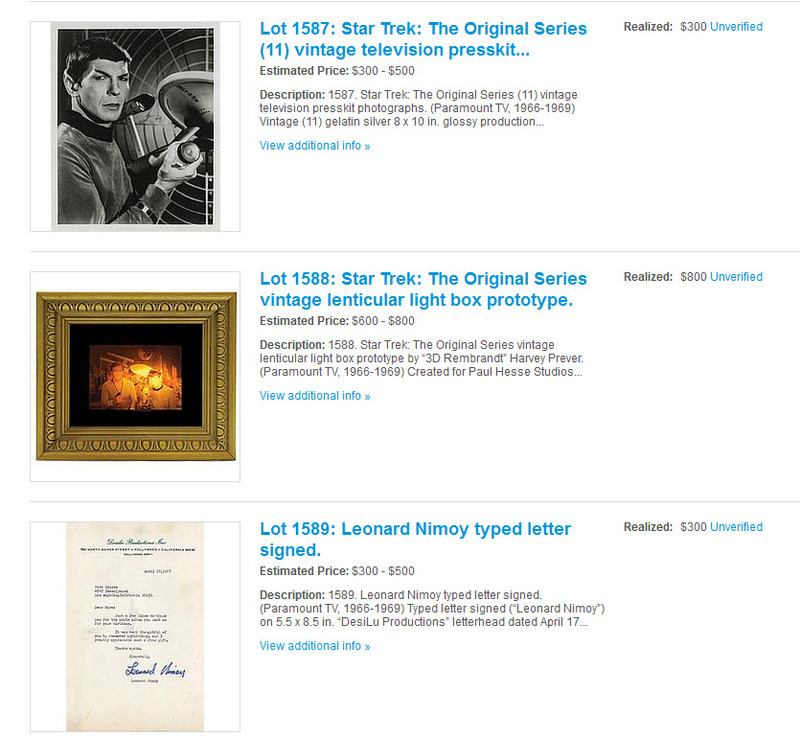 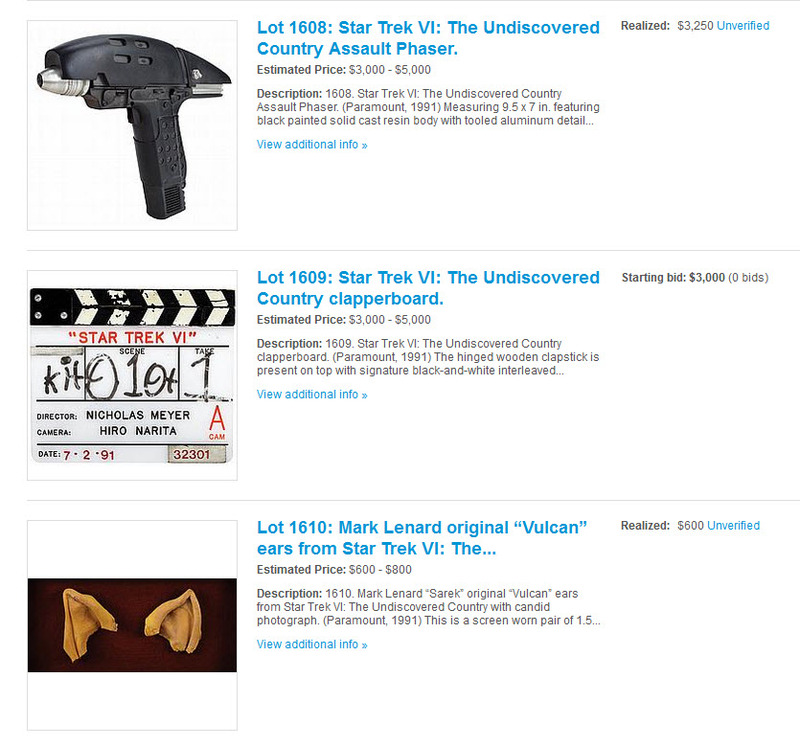 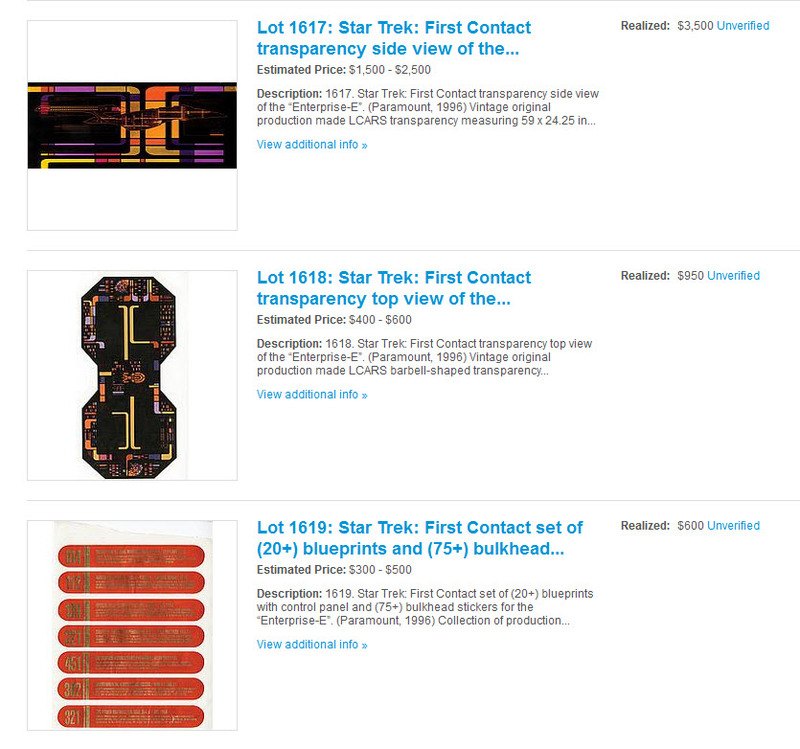 Presented below is the complete set of final prices realized for the 35 lots of Star Trek memorabilia that were offered in Profiles In History's Hollywood Auction 74; which concluded earlier today in a live online bidding session at invaluable.com. 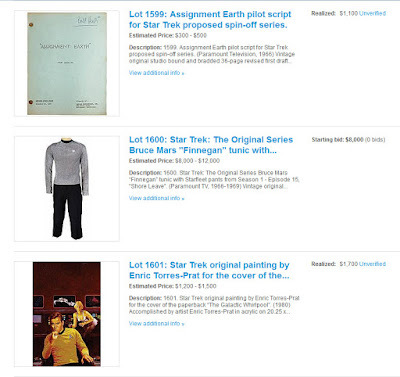 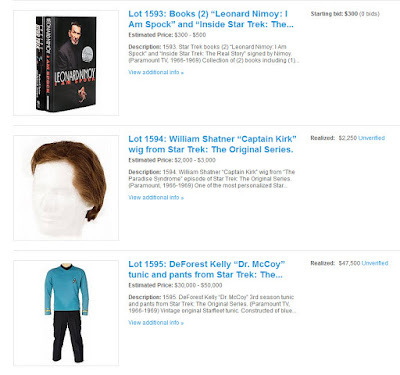 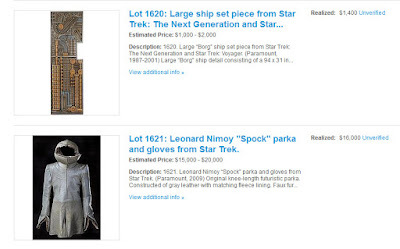 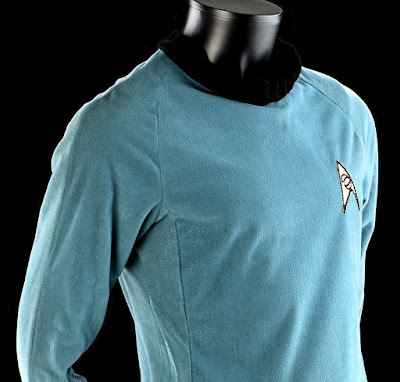 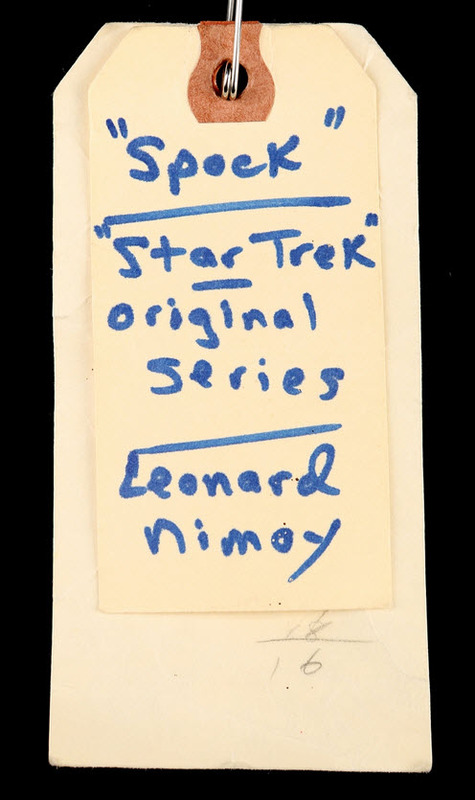 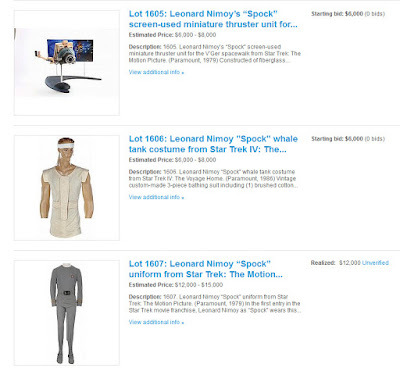 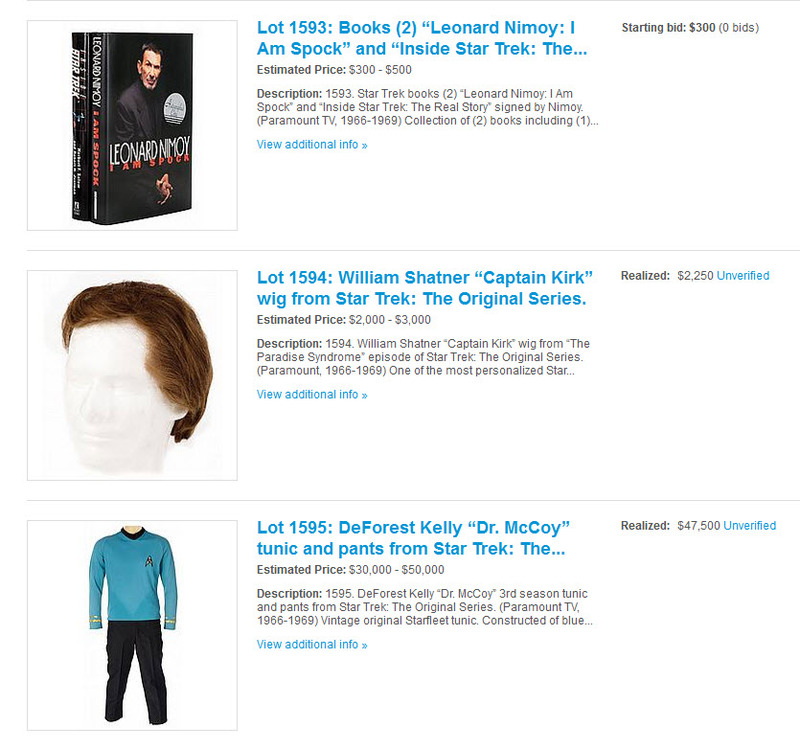 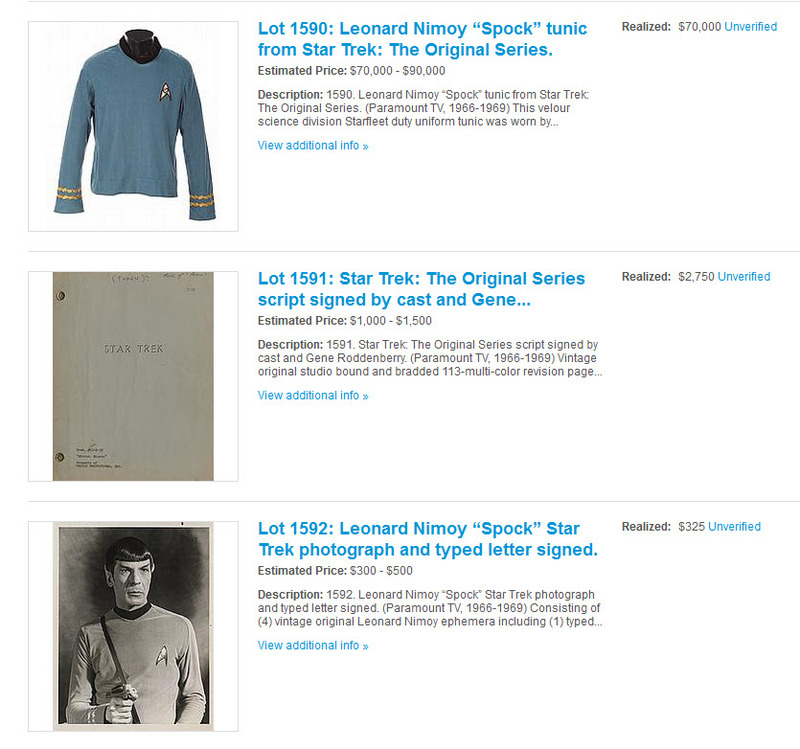 The most expensive Star Trek items which sold in the auction included a Leonard Nimoy 2nd season "Spock" tunic from The Original Series which witnessed a high bid of $70,000; a DeForest Kelley 3rd season "Dr. McCoy" Starfleet uniform from TOS which sold for $47,500; and a Leonard Nimoy "Spock" parka and gloves from Star Trek 2009 which finished at $16,000. 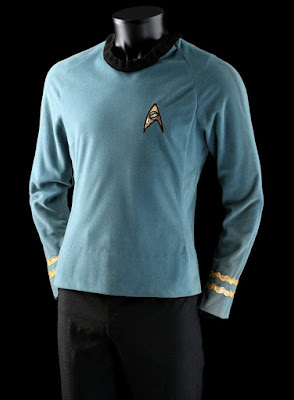 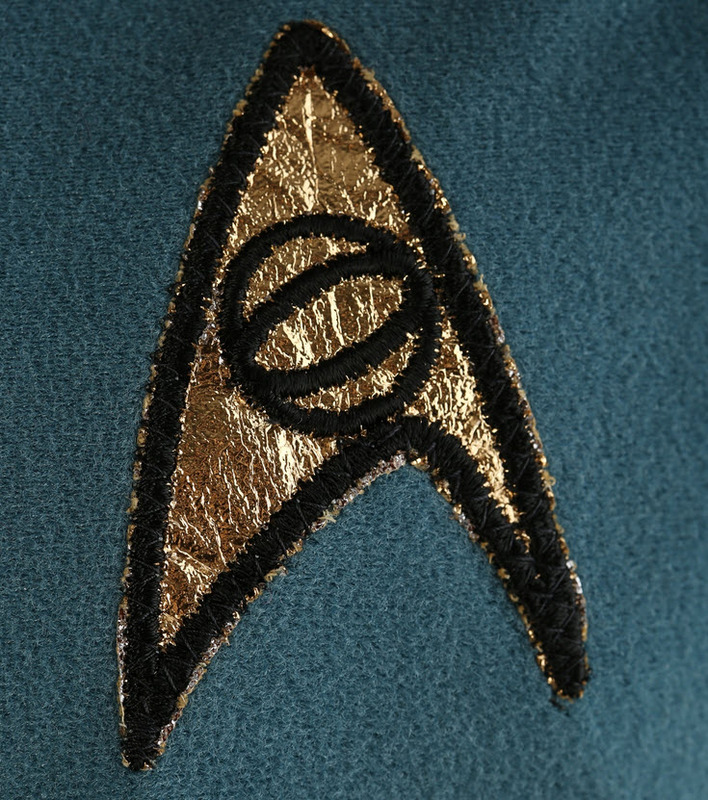 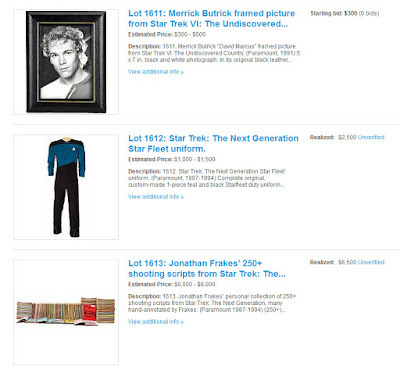 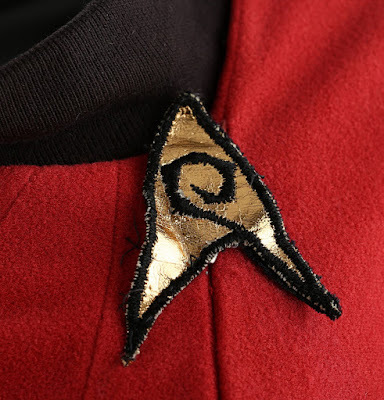 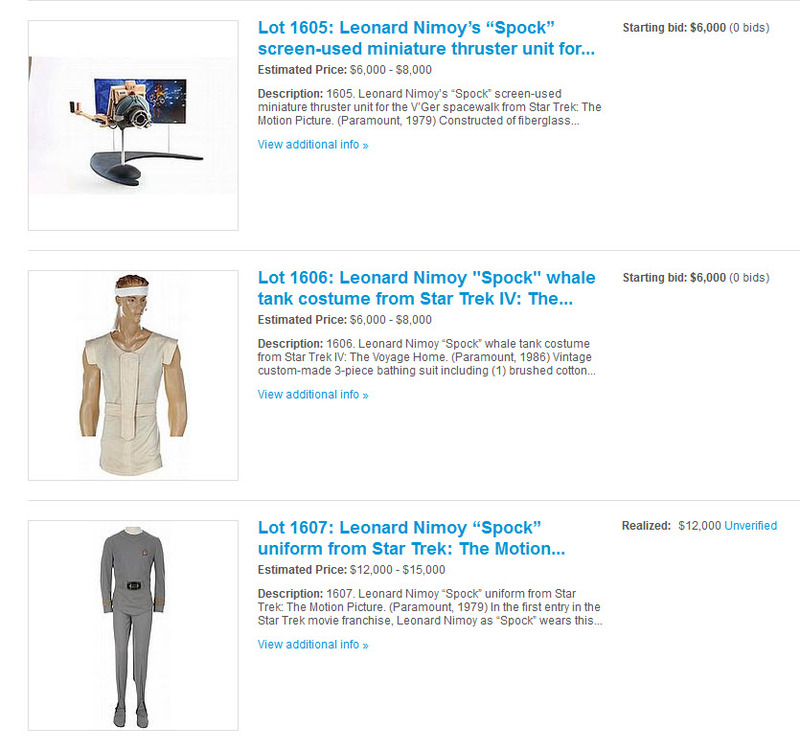 A Leonard Nimoy "Spock" Class A Starfleet Uniform from TMP sold for $12,000.